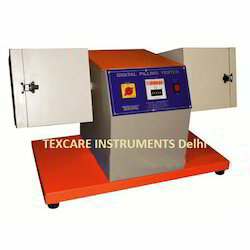 Manufacturer of a wide range of products which include air permeability tester, washing fastness tester, light fastness tester, colour matching cabinet, martindale abrasion tester and pilling tester. As an answer to the ever increasing demands of Air Permeability Tester, we manufacture and supply these at extremely feasible prices. 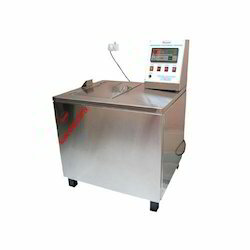 We provide a solution to the variegated demand of Washing Fastness Tester in the market by manufacturing and supplying the same. 200 Nos. SS Balls are supplied with the machine for beating samples during washing. Our company manufactures and supplies a magnificent range of Light Fastness Tester. No. of Specimen Holders: 4 Nos. We are recognized as ace manufacturers and suppliers of Colour Matching Cabinets in the market. 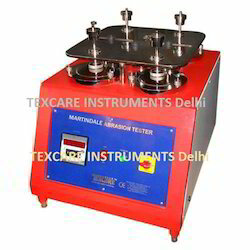 We are offering Martindale Abrasion Tester to our client. 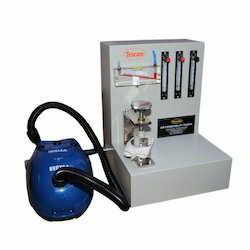 We are offering highly efficient Pilling Tester that is used for determining the tendency to form pills on various fabrics. We are a prominent Button Snap Pull Tester Manufacturer and Supplier. Used to determine holding strength between button/snap and fabrics/garments, our Button Snap Pull Tester is supplied with self-calibration weight of 5.0 Kg. Fabricated with imported push pull gauge of ‘IMADA’ Japan, Button Snap Pull Tester can measure up to 25 mm dia. Button. Our Button Snap Pull Tester is designed with Dial Gauge that displays the result in Kg. Also, Button Snap Pull Tester is provided with a Lower Grasp Button Accessories Kit. We are offering Traverse Thread Counter to our client. 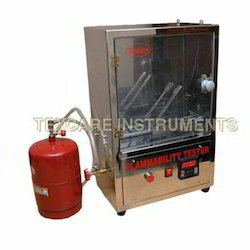 We are offering Flammability Tester to our client. 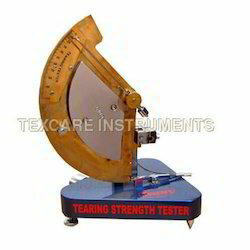 We are offering Tearing Strength Tester to our client. 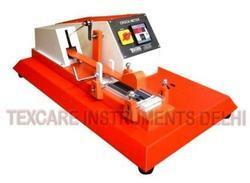 We are offering Rubbing Fastness Tester to our client. Swatch Cutter is used for making swatches of any fabric quickly & conveniently. The specially designed equipment can cut swatches in multiple layers up to a depth of 20mm. This Zig-Zag cutter can make samples out of any type of fabric (woven/knitted or non-woven) with the special German Metal blade. 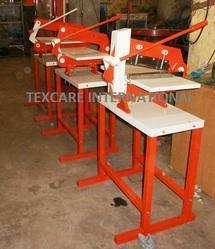 This Fabric Zig-Zag cutting machine used to prepare fabric samples and albums. 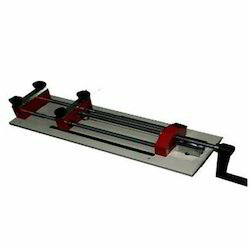 Fabric Extensometer is used to determine the stretch and recovery of the fabric in case of both woven and knitted fabrics. The fabric can be loaded with weight from 1 to 5 Kg. The apparatus consist of one fixed jaw and a moving jaw for fabric clamping, a loading device, and fine lead screw. The unit has the arrangement to provide tension by applying the load with a constant rate of extension. The specially designed scale graduated in two scales, 0-50% & 0-300% for showing the stretch % for woven and knitted fabrics respectively provided. 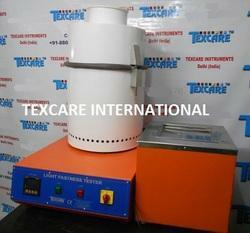 It has been specially developed equipment to evaluate stretch or extension of woven and knitted fabrics. Two scales graduated 0-50% for woven fabrics & 0-300% for knitted fabrics. Possess stainless steel knobs for tightening the jaws for holding samples. Ensures smooth, precision-engineered components for exceptional performance. We are offering Digital Button Snap Pull Tester to our client. We are offering Digital Light Fastness Tester to our client. 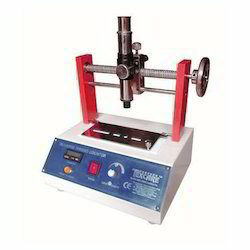 Our company has established itself as a leading manufacturer and supplier of superior quality Industrial Tearing Strength Tester.